For more information about hatching eggs at home read my articles How to Hatch Chicken Eggs in an Incubator and 15 Helpful Hints for a Successful Hatch. Poor Hatch Rate ~ What Went Wrong? Although hatching baby poultry in an incubator can be a fun and educational experience, sometimes we have a poor hatch. It’s very disappointing to spend 21 days turning eggs, filling the humidity trays and waiting patiently, only to have few, or no, chicks hatch. So how do you know what went wrong? These eggs never developed an embryo. Eggs were infertile, old, or improperly handled before hatch. Temperatures were too low, too high, or unstable during hatch. Humidity levels were too high or too low. Eggs were not turned often enough, resulting in leg deformities. Incubator was opened while chicks were hatching. Sorry if this photo is disturbing. I am including it for educational purposes. This chick died only 1 or 2 days before the expected hatch date. You may never know exactly what caused a hatch to go bad. However, you can do some detective work to get a better understanding of what happened. I usually wait 2-4 days past the expected hatch date before I clean out the incubator. If the temps are slightly low during the hatch, you may have a few chicks that start to pip a couple of days late. Once you are sure that no more eggs are going to hatch, take them outside and break each one open. Don’t do this in the house (just in case any of the eggs are rotten). If an egg looks old and runny with no embryo inside, it was most likely infertile, kept too long, or stored at temps that were too warm or cold before incubation, or in the very early stage of incubation. If you find embryos that stopped developing at different stages, it’s likely that the temperature in the incubator experienced too many ups and downs, or the humidity trays dried out several times. If the chick was fully formed, but never broke through the shell, the humidity or temperature may have dropped too low and the chick died. If the humidity was too high from day 1 – 18, the chick may have drowned during hatch. The albumen (egg white) needs to dry out a certain rate so the air space is large enough for the chick to breathe as it prepares to pip through the shell. If the chick pipped through the shell, but didn’t progress past this point, the humidity or temperatures might have dropped too low, or the chick may have had leg deformities or weakness (likely caused by improper turning). It’s a good idea to candle the eggs every week during incubation. Eggs that never develop an embryo may be removed early in the incubation to prevent rotting and bursting open. Trust me, you don’t want that to happen. It is also advisable to make notes during the incubation period if anything unusual happens. If the temperature drops or spikes, the humidity trays dry out, or you forget to turn the eggs… make a note of it on your incubation calendar. This will allow you to compare the end of embryo development to the dates that problems were noted. If the eggs were not turned and fully formed chicks were unable to hatch, you’ll have notes about forgetting to turn the eggs properly. Hopefully the next hatch will be more successful after you learn what mistakes were made this time. Here is a chart of embryo development that is very helpful for determining when the death of an embryo occured during incubation. This is by no means a complete list of reasons for an unsuccessful incubation. There can be genetic problems with the embryos, too much humidity early on, and eggs that were jostled before (or during) the hatch, to name just a few. To reduce problems that cause poor hatch rates, review proper egg care and incubation procedures prior to starting your hatch. Have you had problems with a hatch? 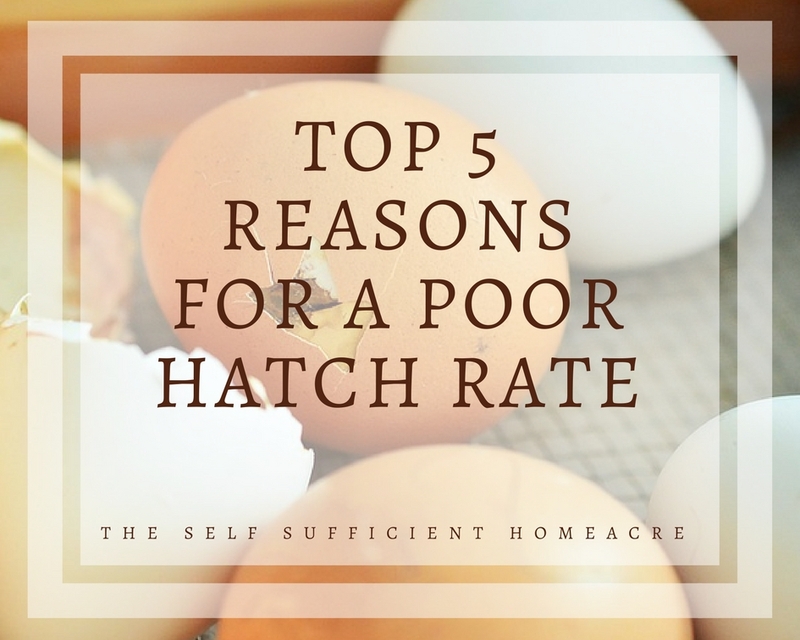 Did you learn how to insure a better hatch the next time? What is your most common problem with hatching poultry at home? I’m curious whether anyone is seeing lower hatch rates with the proliferation of WiFi and cell phones. The newer WiFi signals are far stronger and since they cause fertility issues in humans I’m wondering if they will also cause those issues in poultry. I haven’t noticed any difference in hatch rates. I am having problems with the chicks getting out of the egg.The membrane seems to dry out and sticks to the chick. This is a sign that there isn’t enough humidity in the incubator. If you are opening the incubator to check on them, you are letting the humidity out. If not, you need more water in the humidity trays going into the 3 day lock-down period before hatch day. I hope this helps. From the time the egg is laid until the lock down period during the last 3 days of the hatch, the humidity should not fall below 25% and should not go above 60% RH…so that the air sac in the large end of the egg becomes large enough for the chick to get a breath of air before pipping through the shell. For the last 3 days the humidity should be raised so that the membrane doesn’t dry out and make it difficult for the chick to break through it to hatch. I’m sorry to hear that your leghorn eggs are failing. That is very odd. If you have had eggs from several other breeds in with the leghorn eggs and they did fine, it makes me wonder if there is a genetic problem with the leghorns. Are they very large eggs? I’ve read that you should go with normal sized eggs rather than very large or small eggs. I’ve also read that chicks that grow larger than usual in the egg have a lower hatch rate, but they didn’t say why. If the leghorns were in an incubator without eggs from other breeds, perhaps it is a coincidence and there was a problem with the humidity or temp. If they take longer to hatch, and you are removing the other chicks as they hatch, the humidity might have dropped too low, causing the chicks to dry out too much and reducing their ability to work their way out of the egg. Let me know if you have any other information so I see if anything else comes to mind.